The cutoffs are arbitrary to some extent, but every cutoff is arbitrary if you really think about it. Fielder started hot, slumped, slumped hard, and then caught fire. These are four roughly equal collections. You can see quite clearly that when Fielder got a hit in the third act, the odds it was for extra bases was pretty consistent with act two, he just got many fewer hits period. But then his season started to turn around and while he hasn’t recovered his power from April, he’s hitting for more power, and a way higher average since August 7th. It’s actually kind of remarkable if you separate it out by hard, breaking, and offspeed pitches. Let’s look at batting average and slugging percentage for each. If the pattern doesn’t jump out to you, allow me to demonstrate. He was still hitting breaking balls well and he was pretty consistent against offspeed pitches. Look at the fastballs, my god, look a the fastballs. His batting average and slugging percentage against fastballs plummeted between act one and two and the average dropped off a little more into act three. Now he’s back in business, but man, that thing cratered. 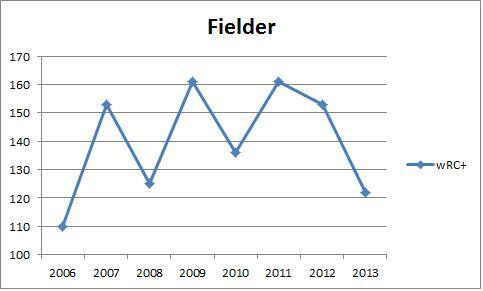 Fielder couldn’t get around on a fastball to save his life for about 80 games and now he’s doing it again. I’m not going to make any connections between issues he’s having in his personal life and his performance. There could have been an injury or a mechanical adjustment that needed to be worked out. But the evidence is pretty clear and pretty stark. 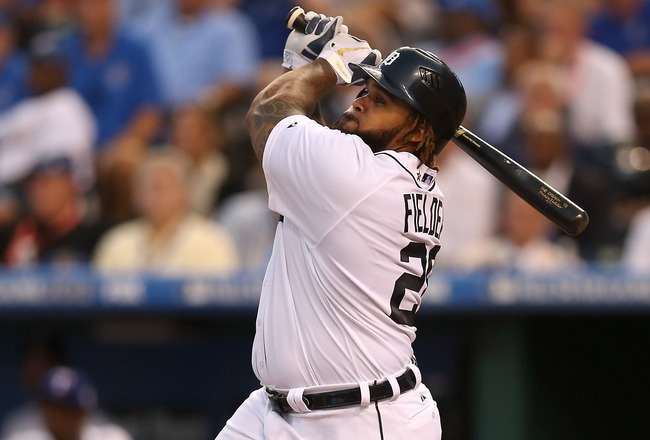 Prince Fielder couldn’t hit fastballs. He didn’t slump the same way against the other pitches and obviously batters see more fastballs than anything else so it’s going to drive a lot of their performance. There’s certainly a game theory/sequencing thing about what pitches are used when that we can’t really untangle right now, but it certainly appears as if Fielder just went through a period of time – for whatever reason – in which he couldn’t catch up with a fastball. That stretch has been over now for 39 games and 170 PA. He’s crushing the baseball since August 7th and the Tigers are reaping the rewards. There’s no reason to thing this problem will reoccur, so there’s no reason to thing Fielder won’t continue to mash heading into October. Whatever was going on from May 11th to August 6th is behind him and the guy who cleans up after Miguel Cabrera appears to be back.